Trend Micro said Hacking Team offered a bogus news app to customers that delivered its flagship spying tool to Android devices. Data stolen from Hacking Team continues to yield information about the company's infiltration techniques. The latest find is a fake Android news app, which was used to install its flagship surveillance tool. The app is called "BeNews," the same name as a long-shuttered news website, wrote Wish Wu, mobile threat response engineer, on Trend Micro's blog. Inside the app is a backdoor that appears to have been used to load the Android version of Hacking Team's Remote Control System (RCS), also known as Galileo, a data-collecting tool the company sold to law enforcement and security agencies worldwide. That malicious component takes advantage of a local privilege escalation vulnerability, CVE-2014-3153, Wu wrote. It is effective against unpatched Android versions from Froyo 2.2 to KitKat 4.4.4. "We believe that the Hacking Team provided the app to customers to be used as a lure to download RCSAndroid malware on a target's Android device," Wu wrote. 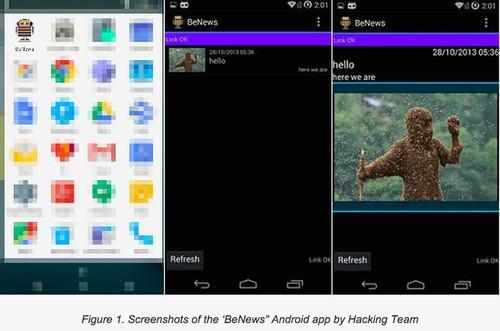 Google scans its Play store for potentially malicious applications, but it appears Hacking Team devised a method so BeNews would not be classified as such after it is uploaded. Android apps ask for permission for certain activities. BeNews initially asks for only three benign ones in order to avoid being blocked by Google, and no exploit code is included in the app, Wu wrote. After it passes the scan, it uses dynamic loading to download and then execute the malicious component after a person has downloaded it. Trend Micro found the source code for the backdoor and server within the 400GB of data stolen from Hacking Team, which had long been criticized for selling spying tools to countries with questionable human rights and civil liberty records. The security company also found detailed instructions intended for customers describing how to deploy the malicious app. Since the data breach, Hacking Team has regrouped and said it planned to develop a new version of RCS to allow its clients to resume what it termed "criminal and intelligence investigations." The data breach exposed several zero-day vulnerabilities, including three in Adobe Systems' Flash Player, which Hacking Team's clients relied on to install the company's software. Adobe and Microsoft issued patches for Hacking Team-related flaws, which means the company may need fresh zero-day vulnerabilities.